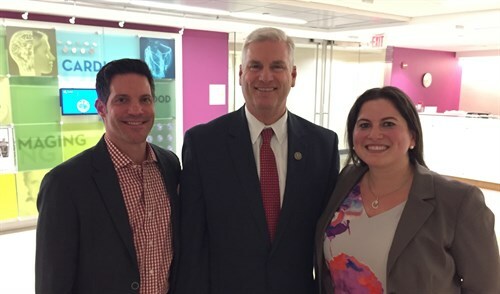 Shaye Mandle and Genevieve Plumadore traveled to Washington this week to continue our strong advocacy for full repeal of the Medical Device Tax. 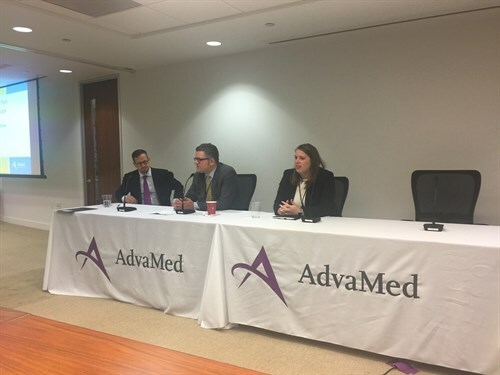 Medical Alley was represented at the annual AdvaMed Capitol Hill Fly-In to meet with members of Congress on our collective MedTech agenda which includes: device repeal, MDUFA Reauthorization, and overall struggles of the reimbursement climate. 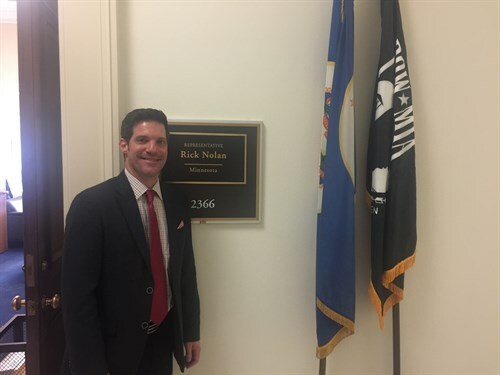 MAA met with members of the Minnesota delegation as well as key staff from the Trump/Pence administration. 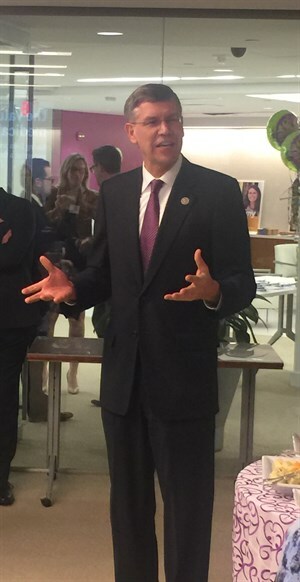 Congressman Erik Paulsen addressed the group of med tech leaders at the AdvaMed headquarters and gave us a preview of the road ahead for repeal. 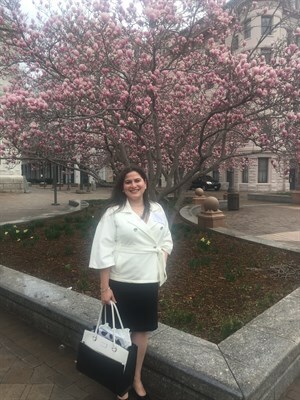 Being on Capitol Hill amidst an administration change was very exciting! There were countless other stakeholders and citizen groups advocating for change on behalf of their constituencies. The Capitol was buzzing! Coincidentally, we were also in D.C. for the State of the State address— which brought with it tightened security lines and road closures. Exciting! 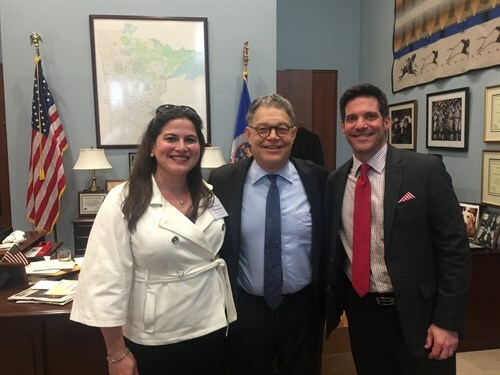 The trip was nicely rounded off with productive meetings with Senator Franken, Congressman Tom Emmer, Congressman Lewis, and other key staff representing Minnesota’s Medical Alley. Earlier this week, representatives from MMB, as well as Governor Dayton, presented the February economic forecast. Currently, the state has a projected $1.65B surplus, which rises to $2B when including cash and budget reserves. MMB Commissioner Myron Frans and other representatives of the department emphasized Minnesota’s modest and steady growth, robust and diverse economy, and consumer confidence. The state is in its 8th consecutive report of positive growth. Nationally, U.S. economic outcomes look generally positive, and current fiscal policy is expected to boost consumer spending. In MN, higher wage growth than expected is due in part to growing industry, more job openings than applicants, and higher projected corporate profits. MN outperforms the rest of the nation in growth, and has a lower unemployment rate than average. Commissioner Frans noted in spite of the positives, significant risks with the February forecast, including uncertainty across the U.S. on fiscal policy, international trade, inflation, and slow-growth expansion as well as shake-ups in direction from the new presidential administration. Each year, thousands of bills are drafted and introduced in the House and Senate. This year alone, almost 2,000 bills were introduced in the Senate, and 1,700 in the House. After being introduced, bills are referred to relevant committees for possible consideration on the legislative floor. Because of the staggering amount of bills that are introduced, not every bill gets a hearing, and not every bill gets to the legislative floor. Instead, committees choose which bills move forward, and committee deadlines are put in place to make sure that all bills wanting to be considered are submitted by a specified date so they can be put through the process in a timely manner. This year, all of the committee deadlines fall in March for this session. The exception is that the deadlines do not apply to House committees on Capitol Investment, Taxes, Finance, Ways and Means and Legislative Administration. In the Senate, the exceptions are Capitol Investment, Finance, Taxes, or Rules and Administration. 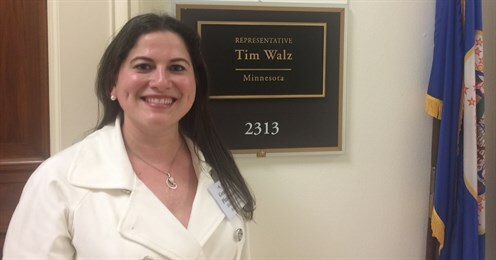 The University of Minnesota testified in both House and Senate committees this week as they made their case before legislators for state funding to advance the university’s initiatives. The President addressed Congress in a joint session on Tuesday night, laying out his vision for his administration for the next four years, and urging Congress to take action on issues important to Americans. However, others were not as optimistic, such as Democratic Congressman Rick Nolan from the 8th District. “The President made some great promises to support fair trade … and bipartisanship – but the problem is we can’t believe him, because at one point or another he’s been on every side of every issue. Hopefully President Trump will be true to his rhetoric and join us in supporting these initiatives,” said Nolan.